Over 300,000 hip replacements are performed across the U.S. each year. 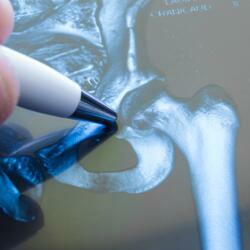 It is one of the most common orthopedic procedures and delivers some of the best results. However, new techniques continue to improve on the procedure. 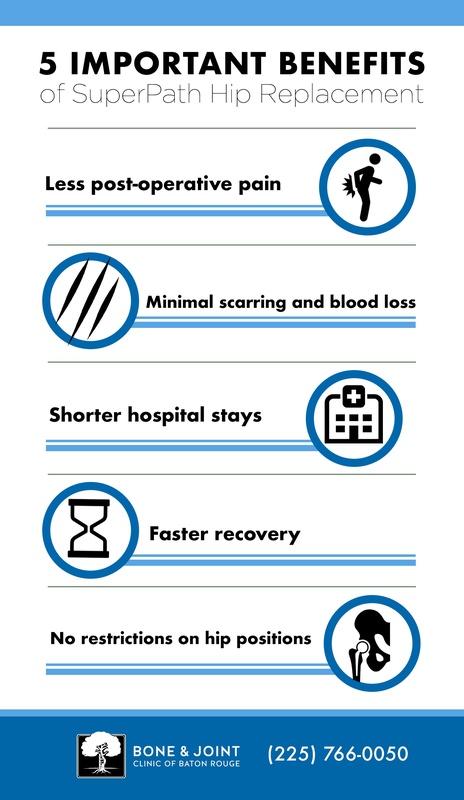 One such technique is SuperPath, a minimally invasive approach offering a large number of patient benefits, including shorter hospital stays and speedier recovery times. When is a Hip Replacement Needed? Therapies such as physical therapy and pain medication are not bringing adequate relief. Hip pain has begun to interfere with the ability to complete daily activities. The hip hurts even while in a rested position. Stiffness makes lifting and lowering the leg difficult. 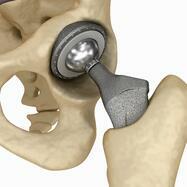 Today, there are three main approaches to hip replacement surgery. Each is safe, effective, and capable of delivering exceptional results. However, some offer greater patient benefits than others. Traditional Hip Replacement - Traditional surgery requires a large incision of 10 to 12 inches and detachment of muscles from the hip. It typically requires a 4 to 5 day hospital stay, 3 to 6 month recovery period, and extensive rehabilitation with limited post-operative movement. Anterior Hip Replacement - Anterior replacements use smaller incisions of 4 to 6 inches and approach the hip from the front, allowing the surgeon to work between the muscles rather than cutting them. Average hospital stay is 1 to 3 days, and recovery takes 1 to 3 months with a shorter period of rehabilitation. 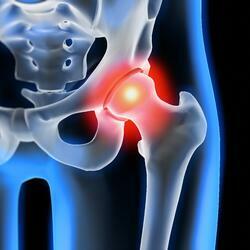 SuperPath Hip Replacement - SuperPath hip procedures also spare the muscles surrounding the hip. These surgeries use an even smaller incision of 2 to 3 inches, average a 24 hour hospital stay, and only require a few weeks for recovery. Patients are often able to walk the same day with the use of ambulatory aids. Dr. Broyles obtained his medical degree from Louisiana State University in Shreveport. He completed a fellowship in Total Joint Replacement under acclaimed hip and knee replacement expert, Dr. Leo Whiteside. 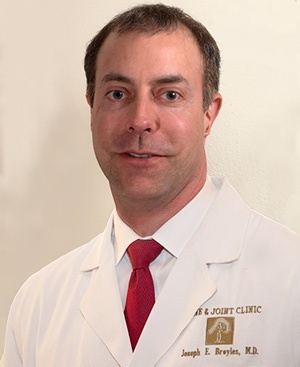 He is board-certified by the American Board of Orthopaedic Surgery.